Tata has finally put their best foot forward with the launch of Tiago. Originally named as the Zica after Zippy Car, the label was changed due to a global outbreak of a virus by a similar name (Zika). With the Tiago, the company is trying to push forward its sales in the domestic passenger vehicle market which have been on a major slump. Tata has this time ensured that Tiago is not just the most powerful car of the lot but it also emerges as the most fuel efficient one too! Apart from power, Tiago also leads in terms of torque! Celerio comes last with the least power and torque. The Tata is also the most fuel efficient car here churning out 23.84 kmpl despite having more muscle than Celerio. The story continues for diesel as well. 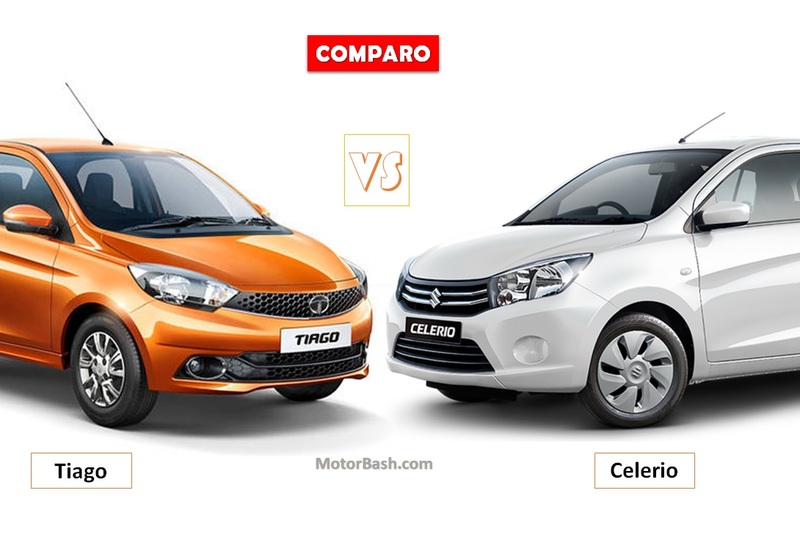 Tiago’s 3-cylinder engine outguns Celerio’s twin-pot motor handsomely. The smaller 793 cc Celerio diesel produces 47.6 PS of power and 125 Nm of torque and returns a fuel economy of of 27.62 kmpl. In comparison Tiago’s 1.05 litre mill churns out 70 PS of power and 140 Nm of torque. At 27.28 km/l, rated Tiago’s fuel efficiency is just a shade below Celerio’s. Hyundai i10 does not have a diesel option. The main advantage that Celerio has in this list is the option of AMT which Maruti calls as Auto Gear Shift (AGS) in the petrol version, which is definitely a boon in city traffic. The Tiago as well as the i10 get 5 speed manual gearboxes. Tiago is slightly bigger and wider than the competition and it shows from its exterior appearance as well. Whereas the Celerio is slightly taller which lends it more headroom. Celerio also gets the largest wheelbase among these three. Tiago gets dual front airbags, ABS with EBD and Cornering Stability Control as standard in the top variant and optional in all trims except the base variant. Celerio gets dual front airbags and ABS as optional in all variants while the i10 does not get any of these features even in the top end trim (and it was given a zero star in crash test results for non-airbag variant and a measly one star in the dual airbag model). Celerio is being offered with the maximum options. Apart from petrol and diesel, you also get a CNG powered version. i10 gets petrol and CNG whereas Tiago, at the moment only gets petrol and diesel engines. Look at the price tab down there! Tiago is sheer value for money and if its long term durability is proved we do not think both these cars stand anyway near. Tiago has started on a positive note and we believe it should be able to do well for Tata for their heart-out efforts. So, which one will you prefer between these three cars?